Twitter is a place where folks do their best to be clever in 140 characters or less. Some – like @bastardmachine, @jimmytraina and @BMcCarthy32 – succeed. I love their quick wit and irreverence. Unfortunately, everyone already knows The Donald… primarily thanks to The Donald himself. There is nothing new to be gained by ridiculing the already ridiculous, so instead I invite you to consider another Twitter user you may never have heard of. 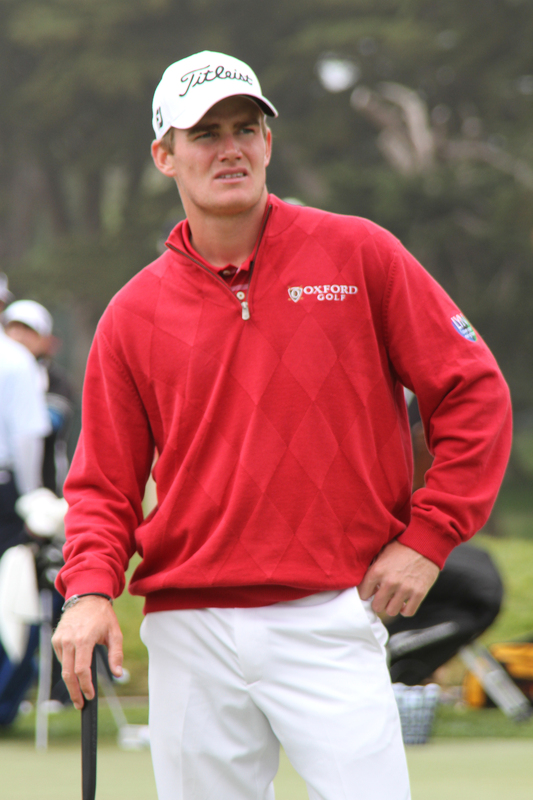 John Peterson is a professional golfer. A very handsome professional golfer. A 23-year old Texas native who graduated from LSU, he’s a three-time All-American and 2011 NCAA Division I Champion. You may recall that I blogged about him this summer, after his hole-in-one at the 2012 US Open. He is also a Republican, and let’s just say Mitt Romney accepted Tuesday’s outcome with a lot more grace than John Peterson did. I can at least be gratified that this only got 23 retweets. This guy is a college graduate right? When was the last time he read something other than a scorecard, like maybe a newspaper? Or traveled to a place that doesn’t have a golf course? He postures like someone who is politically savvy but come ON. Switzerland? I mean, Switzerland is great. However, while tax rates are similar to those in America, the cost of living is very high. A 2009 report by Union Bank of Switzerland showed that residents in Geneva and Zurich pay approximately 20% more for products, services and accommodation than others in Western Europe. What’s more, the Swiss pay approximately 45% more for food. Actually, I suspect any Swiss resident would be thrilled with $6 per gallon gas — today, or four years from now. Based on a quick internet search, a gallon of gas in Bern, Switzerland will apparently run you $7.38. Better be sure the Gulfstream’s tank is full before you leave, John. Oh, and there is no state religion in Switzerland. I’m just saying. What might surprise Peterson most is Switzerland’s health care law mandating that everyone buy coverage, which is subsidized by the government. Wait, I thought Republicans did not APPROVE of healthcare mandates? I wonder if John Peterson has confused Switzerland with The Swiss Colony? Could be that the guy just loves a good cheese log. A few more tweets from John Peterson are below. Unfortunately, he deleted several others advocating secession from “the Union” by “the Confederacy” (which according to John, is where the last truly brave Americans all reside) before I could capture the images.